Dramashop's 2019 season opens with Stephen Karam's 'The Humans,' winner of the 2016 Tony Award for Best Play. When people think of Thanksgiving, it's not a surprise when turkey is one of the first things to come to mind. Although in fairness, time spent with family is what the holiday is all about. Not all families are eager to see each other though, especially when they have to trek in unfamiliar situations … or even cities. The Humans by Stephen Karam follows the Blake family of Pennsylvania as they celebrate Thanksgiving in Manhattan. In case you're wondering, chaos does ensue. Besides all the pandemonium (which includes laughter, tears, and lots of wine) in The Humans, what makes this show stand out is that the director is a regular, talented Dramashop actor Michael Haas. Haas has been with Dramashop since their first season, and when asked about his journey as both an actor and director, "I think that acting and directing are very similar in their goals, but the way you go about achieving those goals are vastly different. As an actor, I'm focused on crafting the best character I can in the given context of the show. As a director, I need to facilitate the actors' performances together similar to a conductor." Haas is no stranger to being a director. He's directed two prior Dramashop shows, and he "really wanted to direct The Humans because of the amazing script. The playwright really created something special that's simultaneously entertaining and also incredibly difficult for the actors involved." "The Humans is a mainstage production that unfolds in real time, and it won the Tony Award for Best Play in 2016 — the same year that Hamilton won Best Musical — so it's by no means obscure or untested. 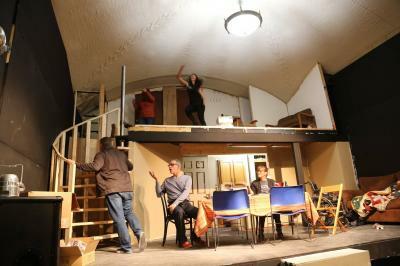 But it's not the kind of play you'd see at other Erie theaters," affirms Zach Flock, artistic director of Dramashop. If you've never been to a Dramashop performance before, not only are you missing out on incredible and unique shows, but the ultimate theater experience. The stage itself may appear small, though in reality, it's anything but. Everyone from director to actors to crew have to give it their all and come together as a team to produce the show. "We focus on the process, not the end result. If you honor the creative process and really work hard, you get a better product, but if you just focus on that end result and don't put in the work, it shows. Audiences are smart and deserve to see productions where the entire company has put in hours and hours of hard work. That's how you produce great theater, and we challenge ourselves to put in the work every single time," says Flock.